Herbert Butler Powell, 94, a retired four-star Army general who served as ambassador to New Zealand from 1963 to 1967, died April 3, 1998at a health-care facility at Williamsburg, Virginia. The cause of death was not reported. General Powell, who lived in Williamsburg, retired from active Army duty in 1963. The Oregon native began his military career with the Oregon National Guard in 1919. He received his Army commission in 1926 after graduating from the University of Oregon. During World War II, he served in Europe, where he became chief of staff of the 75th Infantry Division, participating in the struggle for France, the Rhineland and Central Europe. After participating in the Battle of the Bulge, he eventually served in the delegation that made contact with Soviet Red Army units in Prague near the war's end. During the Korean War, he commanded the 17th Infantry Regimental Combat Team, the only U.S. unit to reach the Yalu River. Later assignments included tours as commander of the 25th Infantry Division, the Infantry Center at Fort Benning, Ga., and the Third Army, based at Fort McPherson, Ga.
Over the years, he had directed special Army panels that studied military justice reforms and that worked on plans for an advanced Army rifle. He also served as Army commander in the Atlantic during the Cuban Missile Crisis, and was cited by President John F. Kennedy for contributions he made to the mission. His last assignment was as commanding general of the Continental Army Command at Fort Monroe, where he directed more than half the Army's 960,000 regular soldiers and more than 1 million reservists. His military decorations included the Distinguished Service Cross, the Distinguished Service Medal the Purple Heart and the Combat Infantryman's Badge. His first wife, the former Beryl King, whom he married in 1927, died in 1989. Survivors include his wife of four years, the former Grace Tuggle, of Williamsburg; three stepchildren; seven step-grandchildren; and four step-great-grandchildren. General Powell is to be buried with full military honors in Section 11, Grave General Powell will be in Section 11, Grave 536-2 of Arlington National Cemetery, with his first wife, on 11 April 1998. 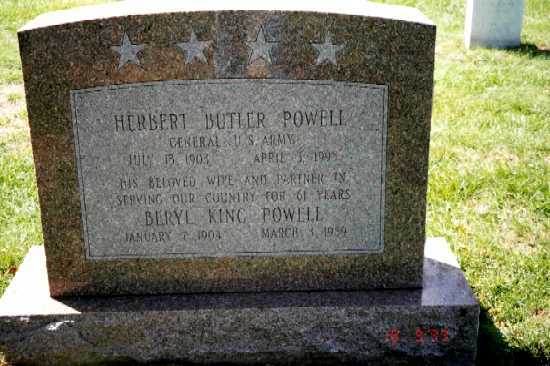 General Herbert Butler Powell, a former chief of the Continental Army Command and former ambassador to New Zealand, died on Saturday, April 3, 1998, at a nursing home in Williamsburg, Virginia. He was 94. Powell joined the National Guard in his native Oregon and retired 43 years later, in 1963, as a four-star general. At the time, he was in command of six armies and their equipment and training throughout the continental United States, responsible for 315,000 military personnel, 69,000 civilian employees, and 1.7 million Reservists and members of the National Guard. He and his aides at the Army command, at Fort Monroe, Virginia, were also entrusted with the task of drawing up contingency plans for mobilization and training, ranging from full call-ups in case of war to limited build-ups for lesser confrontations overseas. President John Kennedy rewarded him for his services in the Cuban missile crisis by appointing Powell ambassador to New Zealand in 1963. He served in the post in Wellington until 1967. Powell was born in Monmouth, Oregon. He joined the Oregon National Guard in 1919, rose from private to sergeant and was commissioned into the regular Army in 1926 after his graduation from the University of Oregon. He was also a 1941 graduate of the Command and General Staff School and a 1949 graduate of the National War College. He reached flag rank by 1960. In World War II, he first was a general staff officer at the War Department, working in operations and training at Army Ground Forces headquarters. Then he served as chief of staff of the 75th Infantry Division as it fought its way across France, through the Battle of the Bulge, into the Rhineland and central Europe. In the Korean War, he commanded the 17th Infantry Regiment in an advance that reached the Yalu River, on the border with China. He also sat on a high-level commission that considered the cases of American prisoners of war who made false confessions to war crimes, like germ warfare, after months of interrogation by their North Korean captors -- the so-called brainwashing issue. Powell returned to manpower control at the Army General Staff in the early 1950s. He then commanded the 25th Infantry Division, the U.S. Army Infantry School, and the 3rd U.S. Army, his last assignment before taking charge of the Continental Army Command in 1960. He qualified as an Army aviator. His decorations included the Distinguished Service Cross, the Distinguished Service Medal, the Legion of Merit with oak leaf cluster, the Bronze Star with two oak leaf clusters, and the Air Medal. Powell's first wife, Beryl King Powell, died in 1989 after 61 years of marriage. He is survived by his second wife, Grace Tuggle Powell; three stepchildren; seven step-grandchildren; and four step-great-grandchildren.